Getting started on investing can be a pretty complicated process. As many of you regular readers would know, I started taking interest on how to make my money work better for me after I saved up $20,000 last year. After all, simply keeping your money in the bank is a foolish thing to do because your money decreases in value over time, due to inflation and rising costs of living. As your parents would tell you, $100k in the past could buy you so much more than $100k today. I've to confess that SGX has made it a lot harder for people to start investing by implementing various measures, in order to ensure that those who invest have the prior knowledge of the risks they are getting themselves into and are qualified to invest. 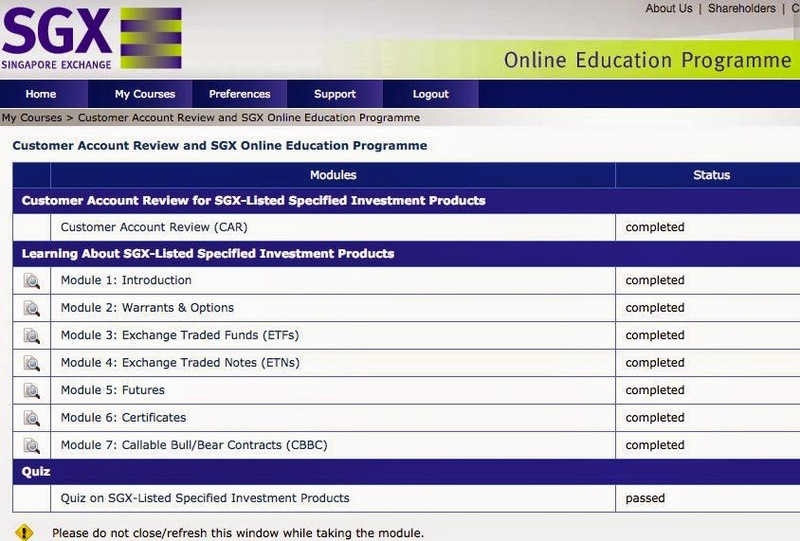 You're required to first take an online course by SGX before you can start investing. Most brokers will also require this as a pre-requisite before they can open your brokerage account for you, and this is probably the part which will take up the most of your time. 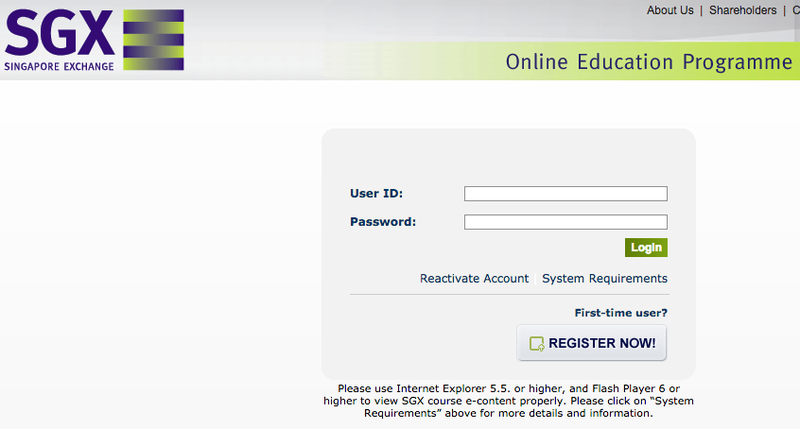 You can sign up for SGX Online Academy here. It's free! On top of the mini quiz questions that you'll be asked during the modules, you have to sit for a final quiz upon completion. This quiz consists of 20 questions covering all the modules taught, and you'll have to pass the quiz before you can be deemed as qualified to start investing. You'll need to declare your quiz score and date of assessment (presumably for them to double-check that you're not lying) to the brokers before they will assess your application to open an account. If you choose option 1, you can download CDP Application Form here. Submit the completed application form to SGX CDP Customer Service, which is located at 9 North Buona Vista Drive #01-19/20 The Metropolis Singapore 138588. After your CDP account has been created, you'll need to link it to your choice of brokerage firm via their own application forms. If you choose option 2 (which was what I did), you can go straight to a brokerage firm and get them to create your CDP account on your behalf. The same CDP form will be given to you to fill up, and they will coordinate the rest for you. How to choose a broker? There's no right or wrong, or "best broker". Key questions to look out for are a) markets you're interested in trading and b) minimum commissions. Watch out for the last one, as signing up with a brokerage which charges high commissions could potentially mean you may end up spending a lot especially if you transact frequently, since charges are per transaction. This is another lengthy process, so do spare some time to properly fill up the application documents before submitting them. You'll need to submit your NRIC and either your passport / driving license / CPF statement / latest payslip as well. Each broker has different application documents so I will not be providing any links here. You may go directly to your broker for the respective forms required. 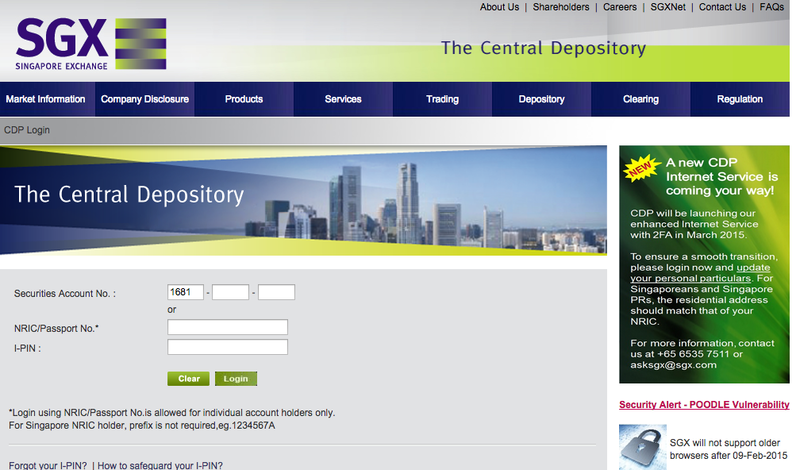 Or you can also log in directly via your brokerage, which is the easier method if you want to buy / sell shares. 1. Always invest in business you are in contact with daily. Why? Give it a thought, you might get what i meant. 2. Never get tips from broker or remiser. why? Explain another time. 3. Always invest small and for long term. why? Start Small, Think Big. 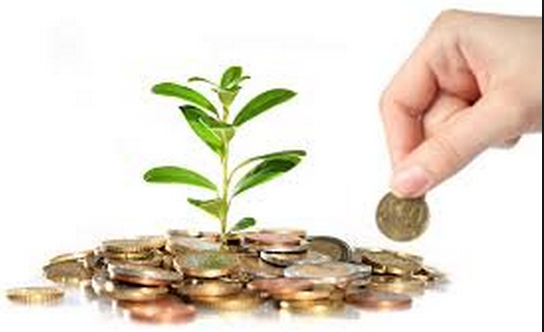 Any mistake made during small investment can be rectify by diversification of portfolio. 4. Peace of Mind should be the main objective in investment, not sleepless night. 5. Last but not least, Saving is the mother of all investment. Without Savings, let's not talk about investment. That is why you should never show hand in any investment. Very comprehensive. Haha I found this too late.